We miss Honda's Accord medium-sized model. The Japanese brand hasn't revived it - but it has done then next best thing, bringing us a four-door version of its tenth generation Civic. It's a model large enough to satisfy you if you used to own an Accord. And if you didn't but want something a little different with four doors and a boot, it might be worth a look. By and large, compact saloon volume brand models don't sell well in the UK. Volkswagen has recently had to discontinue its Jetta four-door model here for just that reason. Which is odd when you consider just how many hundreds and thousands of BMW 3 Series, Audi A4 and Mercedes C-Class models we buy on these shores, cars that aren't really that much bigger than saloon models of 'compact' size. What though, if a volume brand could launch a four door that wasn't so compact? And had a bit more about it in terms of character and technology? Might it do better? 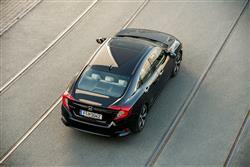 Honda is certainly hoping that's the case, with this saloon version of its tenth generation Civic. The engine range on offer here is pretty much the same as you get in the five-door hatch, expect that you don't get the 182PS 1.5-litre VTEC Turbo petrol unit that's offered with that hatch model. And obviously, there's no 2.0-litre petrol Type R hot hatch variant. This means that Civic four door customers are faced with a choice of two very different powerplants. Either a 129PS 1.0 VTEC Turbo petrol unit. Or a 120PS 1.6 i-DTEC diesel. Both come with the choice of either 6-speed manual or CVT automatic transmission. 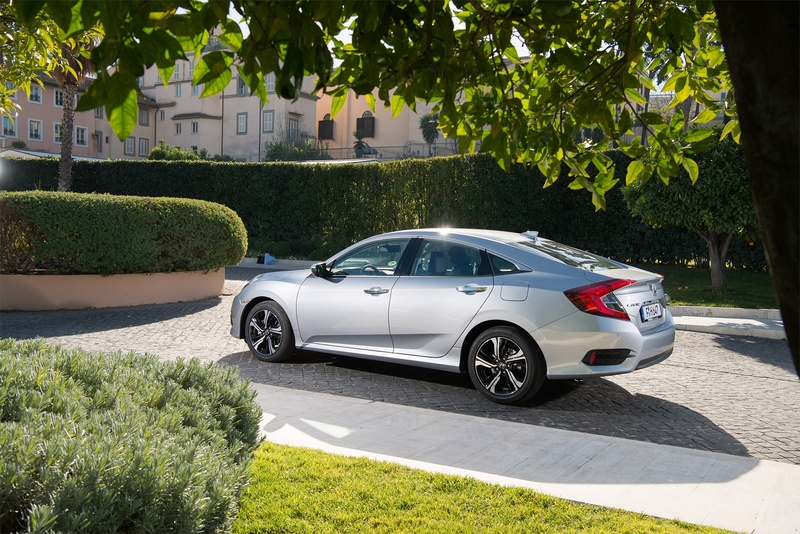 This Honda's easy to manoeuvre around town, though it does have a slightly larger turning circle than some of its rivals. What we particularly like though is the way his car feels so driver-centric right from the moment you first set off in it. The perfectly positioned seat and pedals help here. So does the manner in which the gear lever falls beautifully to hand and the way in which the futuristic dash delivers everything you need to know in perfect line of sight. As the miles roll by, you'll also be struck by the near-perfect weighting and smoothness of the brake and clutch pedals and, we'll say it again, the lovely, snickety precision of the six-speed gearbox. In short, you don't need an expensively powerful engine to feel fast in this car. Which is one of the things we like most about it. Wider, longer, and lower than any of its predecessors, this Civic saloon has a short front overhang and taut lines that claim to reference strong aerodynamic efficiency. A sharp and aggressive 'face', along with pronounced wheel-arches aim to hint at what Honda calls this saloon's 'sporting character'. Similar to the hatchback, this model's wide, long platform results in impressive interior space for this class of car - almost as much in fact, as you'd get from a 'D'-segment Mondeo or Insignia-style model. The interior features a simple, uncluttered layout and a sophisticated design theme that includes a digital instrument binnacle. At the top of the centre console, there's a 7-inch Honda Connect 2 colour touchscreen display. The seating position is low-set to give the driver a greater feeling of connection with the car, and there's a big boot. Expect to pay around £500 more for this saloon body shape than you'd have to find for a conventional Civic five-door hatch. That means pricing which starts at around £19,400 for the entry-level 'SE' version of this model powered by the brand's 1.0-litre 129PS VTEC Turbo petrol engine. There are also 'SR' and 'EX' trim levels further up the range and for £1,400 more, you can have the CVT auto gearbox that a lot of Civic four door buyers will probably want. The other engine on offer, the 1.6i-DTEC diesel, requires a £1,400 premium over the petrol unit, so starts at just under £21,000. Again, there's the same choice of manual or auto transmission. Key safety inclusions across the range run to a 'Collision Mitigating Braking System' that brakes the car to avoid an accident. Plus a 'Forward Collision' set-up that warns you of oncoming hazards. And 'Lane Departure Warning', 'Road Departure Warning' and 'Lane Keeping Assist' features that'll keep you from veering away from where you should be on the road. There's 'Traffic Sign Recognition' that reads speeds signs as you pass and displays them on the dash, this set-up then working with an 'Intelligent Speed Assistance' system that can automatically set your speed to match the prevailing limit. 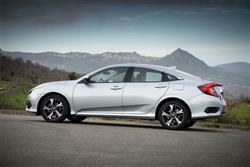 Civic four door buyers get two class-competitive petrol engines when it comes to running costs. The brand claims that the 1.0 VTEC TURBO petrol unit can match the best of the competition when it comes to fuel and CO2 returns. Expect 58.9mpg on the combined cycle and 110g/km of CO2 from the manual version. The 1.6 i-DTEC diesel unit offers a competitive package in this regard too, with a combined cycle economy showing of 83.1mpg and CO2 returns of 91g/km. Whatever engine you choose, you'll do slightly better efficiency-wise with the CVT auto gearbox. On to the warranty, a three year/90,000 mile deal, which is a bit better than most rivals who tend to offer guarantees limited to 60,000 miles. There's also a fixed-price comprehensive aftercare package called 'Five' which includes five years' servicing, five years' warranty and five years' roadside assist. Residual values have always been a Civic strongpoint. If you�re looking for a new Honda Civic 1.0 VTEC Turbo SR 4dr Petrol Saloon for sale, you�ve come to the right place. At Bristol Street Motors we don�t just have the best Honda Civic 1.0 VTEC Turbo SR 4dr Petrol Saloon deals, we also offer friendly advice and help with all your enquiries to ensure your buying experience is a happy experience.